Fall and is definitely a season of apples! At least in North America. The apple dominates many seasonal activities, foods and symbolism. I asked my students to research Samhain traditions throughout Europe (Samhain is of course inherently Celtic, but many other European cultures see the Fall as a time to celebrate the reaping of the harvest and death as Fall fades into Winter) and one of my students found a tradition in which people bury apples to feed their ancestors, which inspired this post. The tale of the serpent and the apple is one that probably almost every person in Western culture is familiar with. The apple, the forbidden fruit, is the symbol of Eve’s disobedience and in many ways, women’s power over themselves, their bodies and their choices. It is also a reminder that Eve was not Adam’s first wife. Lilith, the snake, she who would not be ignored, is one woman that Western culture often conveniently likes to overlook. The apple represents knowledge and the ability to reason, and therefore make our own choices and not simply follow the instructions of an uncaring deity, the way that Lilith did before she was cast from the Garden. Of course, Lilith is a much older deity than the one dimensional character she plays in the Old Testament. Lilith is remembered originally from the Epic of Gilgamesh, a text that was written probably around 1800 years before Genesis. Lilith sits in the Huluppu tree that Inanna has planted in order to use to build a new throne. Inanna is the goddess of creation and she is afraid of Lilith, who represents the chaos of the primordial world. Inanna asks Gilgamesh to rid the tree of Lilith’s presence, in order for Inanna to establish her order over Lilith’s chaos. Of course the tree, just like the tree in Genesis, is the World Tree or the Tree of Knowledge, and Lilith is the feminine spirit that inhabits the tree. In Genesis, Jehovah wants an inherently masculine world and Adam promises not to eat the fruit of the tree, which is feminine in nature. Eve never makes that promise and when the serpent tells her to eat the fruit, she has no qualms about doing so. 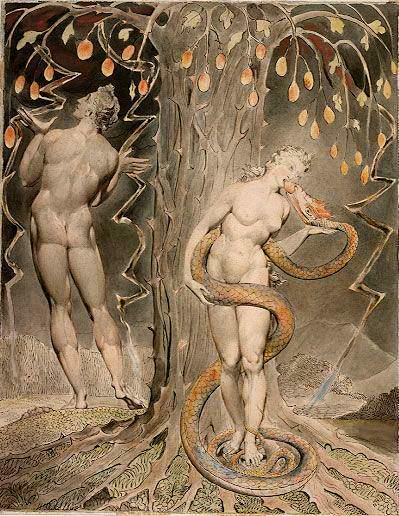 Of course, Jehovah cannot stand to have female energy dominate his new world and casts both Adam and Eve out in order to contain Eve’s possible knowledge. Lilith is known as the mother of demons; motherhood here seems to be the ultimate evil. When Eve was cast from the Garden, she is forced to endure pain in childbirth. To this day, menstruation is seen as unclean throughout many cultures and in those cultures, being male is the only way to be truly pure. Another story of the apple representing knowledge and discord is the infamous Apple of Discord thrown by Eris, eventually causing the Trojan War, a war that transitioned the world from the age of myth and heroes to the age of history and reason. Again, women are seen as being at the cause of the issue of the apple and of the war itself. Where did this apple come from? It was the apple that Hippomenes used to distract Atalanta from beating him, apples he got from Golden Aphrodite, the goddess of love, thus forcing Atalanta to marry and become a mother. Do we see a common theme in all of these apple stories? 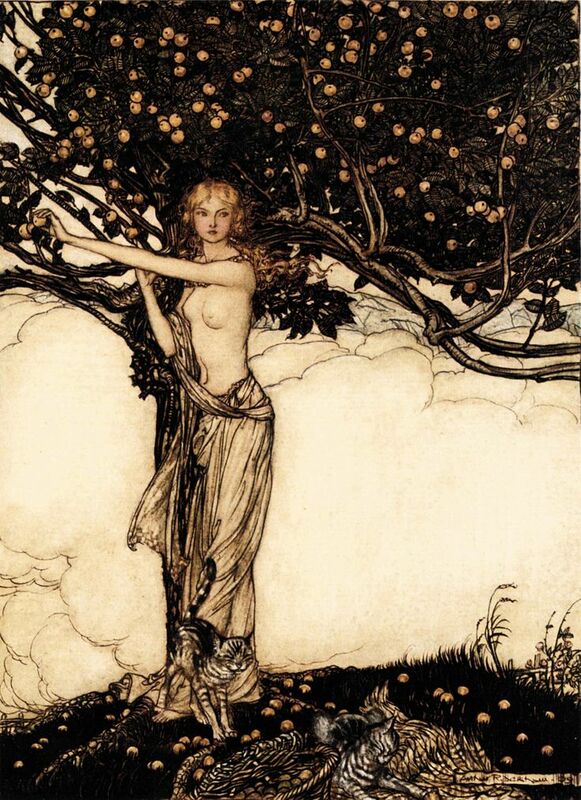 In North mythology, Idunn guarded the golden apples which kept the Aesir young. When she was kidnapped for her golden apples by a frost giant, Loki had to rescue her to ensure that the Aesir wouldn’t age. The apple is a symbol of rebirth and beauty, just as in the other myths already discussed. Of course, there is also Avalon, the Isle of Apples, the place where Excalibur is forged and that is famous for mystical, magical practices. Both Morgana Le Fey and Nimue are associated with Avalon and apples. Arthur is taken to Avalon in order to recover from wounds received during the Battle of Camlann, the battle where he fought Mordred and lost. In later fairy tales, the apple shows up over and over as well. The most famous instance is perhaps the apple in the story of Snow White. Unlike the Disneyfied version of Snow White, the Witch Queen disguised as an old beggar woman first tempts Snow White with golden combs and a beautiful corset. The combs are poisoned and when they are removed from her scalp, Snow White wakes up. When the Dwarves cut the corset off Snow White, she is able to breathe again and is once more OK. But with the apple…the apple is stuck in her throat and this time the Dwarves can’t understand what is wrong and can do nothing but put her in the famous glass coffin. Unlike in most modern versions, it is not a kiss from the Prince that awakes Snow White, it is because when the Prince comes and sees Snow White, he demand that the Dwarves allow him to take the beautiful woman in the glass coffin home with him. In the course of carrying it, the coffin is dropped, jolting the apple out of Snow White’s throat. It is only through the Witch Queen’s careful initiation that Snow White gains the knowledge she needs to claim her rightful place in the adult world and become a wife and mother. Apples are inherently important throughout western myth. And the apple and the witch figure often go hand in hand. 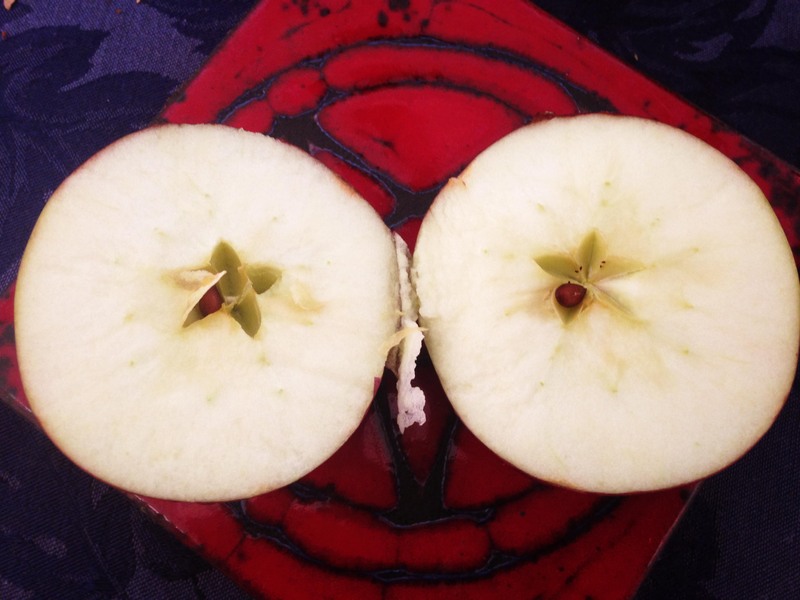 In Gardnerian Wicca, its a sacred act to slice an apple down the center in order to see the pentacle inside. Apples are often used in divination and love spells. If you can peel an apple without breaking the peel and then toss the full peel over your shoulder, the peel should form the initials of your true love’s name. CIder is of course the base of Wassail and is found as a part of ritual throughout the year. The wood is used for many different magical purposes as well. Many shipbuilders traditionally wouldn’t use apple wood to build ships, because apple wood was used to build coffins, again helping people transition to the Underworld. The apple is the foundation of so much of our myth and ritual; take the time this Samhain to enjoy the apple season. Go to an orchard and pick apples with your friends and loved ones. Cut an apple open on the full moon and thank the Goddess for another year. Bury apples so that the dead have something to eat. We often take the apple for granted and forget its many magical uses. When you eat an apple, you are eating the fruit of knowledge and are acknowledging the power of the sacred feminine and at the end of the day, just like the sexuality of women, the apple is simply a delicious fruit that should always be savored.